Walking in, I noticed the 'House Full' sign outside to prevent eager theatre enthusiasts from trying to grab those elusive last minute tickets. Anyone would think that they were queuing for the entrance to Wonka's Chocolate Factory - no, wait, that's at the Drury Lane theatre! Here they were apparently queuing for a holiday to Salt Lake City and then an instantaneous jump to deepest darkest Africa, which by the way was seamlessly crafted in Scott Pask's set. The trick I always enjoy with an effective set is not realising anything is changing until it unveils itself.This was done splendidly - scenes from Mormon history or spotlights on characters cleverly veiled the changes to brightly coloured new sets. Not overdesigned or spectacular but overall very effective, the sets were very much the backing to let the performers shine through. Alternatively, keep reading. Knowing the entirety of the story, dialogue and songs back to front will not put you off from wanting to see this spectacle in the flesh. Indeed I was most likely one of the only Mormon virgins in the theatre (except some of the characters of course, with their homosexual tendencies and baptismal purity). Now normally I don't like seeing a production with too many enthusiasts because they start laughing at the joke about 5 seconds before it happens and that just gives the game away. But for this show, like The Rocky Horror Picture Show, I would really recommend it; the vibe of the audience feeds into this production and takes the performance to new heights. But unlike the majority of the audience, I was new - the only Mormon song I knew was 'I Believe', delivered expertly by Elder Price (Gavin Creel) and the General (Chris Jarman) at the Olivier Awards 2014. This song was well picked for the ceremony as it does sum up the musical accurately in one line sung by Creel, "I am a Mormon and a Mormon just believes." Even before casually swooping 4 awards including Best New Musical and Best Actor in a Musical (Creel), I had Mormon at the top of my must-see list and I was now merely moments away from the magic. I had my programme at the ready, which I always buy as a momento and then regret because they are overpriced and bitterly disappointing, a plethora of adverts and the same West End theatre history that you skip over to read the 6 middle pages that are actually about the production. The lights went dark and the show began. What I experienced that evening was everything I expected Mormon to be. What I experienced that evening was everything I expected Mormon to be. It met but didn't exceed my expectations, and that is only because the bar was set incredibly high. Sell-out tickets, rave reviews, award-winning and still with the original West End cast would make anyone assume this to be a top notch musical. 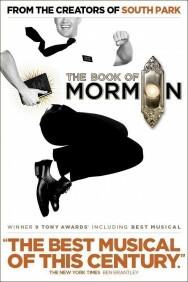 Opening on a scene reminiscent of Spamalot with a Monty Python styled look back at the birth of the Mormon religion, you are instantly hit with the comedic style that pervades the entire show. In no way were the creators Parker, Lopez and Stone playing it safe with this endeavour! But then looking back at the trio's credits which include creating South Park, Team America (Parker and Stone) and the hit musical Avenue Q (Lopez), it's hard to imagine anything other than shocking and avant garde lyrics that take effortless jabs at all manner of different cultures, races, genders and of course religions. In addition, the writers quickly desensitise the audience to currently taboo words and ideas by throwing them out with force and regularity. Anyone would quickly forget the meaning behind them (the swearing isn't quite in the league of Jerry Springer: The Opera but it's not a million miles away!). After the prelude came the opening song. I always think that a musical becomes a hit within that first song because it sets the tone with the cast and the band. The tone that this song set was, 'we're not afraid to sail close to the wind, but we'll do it with a smile and a perfectly harmonised 3rd!' The band opened with high energy and this didn't let up in the slightest. Interlocking lines of harmony (it reminded me a lot of the opening number to Company) fly about throughout the song with the main cast consistently showing you how they can hold their own vocal lines. A couple of members stuck out like a sore thumb with poor accents and emotionless Ken doll faces, but the remainder were definitely on the same page. These were completely in sync and yet each had individuality, with the differing voices cleverly catered for in the music allowing the actors to display their comedic sides. Directed effortlessly by Casey Nicholaw and Parker, I immediately witnessed a cast that really cared for the musical and were putting their full effort into the show, even on a double shift Wednesday. The audience were instantly hooked and responding to the atmosphere with aplomb. The story of this particular musical centres around 2 Elders, Price (Creel) and Cunningham (Jared Gertner, Olivier nominated), who are paired together in the brotherhood when their Mormon training ends. With hopes of where they will be sent to complete missionary work in spreading the Mormon faith, Creel is dismayed when the pair are sent to Uganda ("Cool! Where is that?!" Cunningham exclaims) to a tribe plagued by an evil general. The natives have lost faith in God (just look out for the song Hasa Diga Eebowai!) but the elders are determined to baptise them into the Mormon faith. A love story between Cunningham and the tribeswoman Nabalungi (Alexia Khadime), hellish nightmares and the threat of female genital mutilation ensues. Both Elders are forced to question their own faith and look inside themselves to find out whether they can Man Up when faced with disaster. The thing I appreciated from this musical straight away was that it had this capability akin to a truly great yet brash and rude comedian - it could insult everything about you to your face and you would simply laugh and agree because 1) it was true and 2) it was delivered with impeccable timing. Trust me, no one was going to heckle this musical, it would bite back! With the first song over, everyone started to settle into the rhythm of the production, laugh with the gags (hopefully) and appreciate the character nuances. Having never met a Mormon or a Ugandan tribesman I couldn't say that the cast played their parts accurately. But of course that wasn't the point - the character representation was so over the top that the audience knew instantly not to take it seriously, which was exactly the point. Tongue in cheek and overtly abusive are phrases now synonymous with Mormon. Speaking of which, the actors. When both male leads are Olivier nominated you expect professionalism, but I didn't expect them to be so good in such different ways. Both fiercely comical and committed, Elders Price (Creel) and Cunningham (Gertner) instantaneously worked well together in a typical Batman and Robin duo; Creel standing tall with a poised comic arrogance and Gertner equally enthusiastic to acquiesce and be the follower. Creel's incredibly animated body language and expressive face really made the character come alive - the audience was simultaneously rooting for him to succeed and wishing he would fall back down to earth with a bump. By contrast Gertner epitomised the bumbling fool that follows self-promoted heroes around and made it clear that Cunningham was a few playing cards short of a full deck. The storyline shifted the position of power between these 2 leads as it progressed and I enjoyed the way that the capability of the actors almost matched that. Whether intentional or not, Creel stole the show in the first half with his veneer of almost sickly confidence and piety, but as soon as the interval had passed he shrunk back. It was almost as if he had given too much in that first half and had nothing in reserve to attack the second half with. Or maybe he was intentionally mirroring the transformation that Elder Price experiences to become a more humble servant of God. By comparison, Gertner bided his time, let Creel take the limelight and then pounced with a late surge in the latter stages of the production. He suddenly brought Elder Cunningham to life in a way that wasn't seen earlier on, with a more intelligent comic timing. Watching the two together was like watching a track event; one was quicker out the blocks but faded towards the end whilst the other had a false start but pushed forward and surged ahead to the line. The most powerful thing about it was that it wouldn't have worked if seen in isolation. The competition was only there because both leads were so well honed in their craft and that was really something to see. I say see, but for most of the musical I was in tears of laughter so seeing was difficult at the best of times! For most of the musical I was in tears of laughter so seeing was difficult at the best of times! If we are talking about the actors then 2 more names must be mentioned. Firstly, Elder McKinley (Stephen Ashfield), the self-appointed leader of the Ugandan village cohort of Mormons, is played with a subdued homosexuality made completely obvious from the off. This couldn't be more clear than in the number Turn it Off and Ashfield delivers these character nuances with flair in a tap dancing chorus number. Secondly is Nabalungi, played with a naïveté and innocence as she desperately clings on to hope that there is a better world out there than her current status quo. Khadime plays this role with a vulnerability that is immediately endearing. Her vocal performance overall is impressive, but there were some initial nerves that she had to shake. The first solo song Salt Lake City was delivered with confidence in the top register but had pitch problems in the lower notes as she tried to sing in her character's accent. It was as if she was struggling to find the balance between an authentic performance and showing off her mezzo soprano range. Overall though she did gave some hair-raising vocals and provided a great romantic interest for Cunningham. This too was written with a witty lyricism by Parker, Lopez and Stone - Baptise Me is the perfect song to highlight the awkward yet endearing relationship the characters cultivated. Creel should also be praised at this point for a powerful voice that echoed throughout the theatre with absolute diaphragmatic control. You And Me was delivered with vocal security and Creel maintained his comic arrogance in a song that clearly was a shot at The Wizard and I (Wicked). Elder Price sure had a mountain to climb by challenging Elphaba and I am not judging who won that contest! So back to the story. The book I felt was overall strong and had great flow with all the elements you'd expect from a musical - love interests, threat from an evil warlord, those lightbulb moments for the main characters and of course the happy ending. The prose dialogue however was overshadowed by the lyrical prowess of the verse. With mature, witty and cleverly conceived lyrics, the songs were really going toe to toe in competition with the previous year's musical blockbuster. When Tim Minchin turned his comedy talents towards the stage, Matilda quickly triumphed over other productions in this field... Until now. The songs were indeed plentiful with almost more singing then dialogue (not quite in the same league as Les Miserables though). Varied melodies with cleverly composed overarching musical themes ran throughout the show and each song had that classic Mormon tongue in cheek wit, ripping apart any subject matter put in its path. For the savvier music enthusiasts there were also musical homages paid to other productions - Wicked and Company are already mentioned above. Two By Two opens with a Grease-like shoo bop reminiscent of the 50s, All American Prophets incorporates the preacher/ gospel motifs that Sister Act lovers will recognise and Spooky Mormon Hell dream reminded me of a cross between Michael Jackson's Thriller and We Will Rock You. Price's top notes in the latter song are as strong as Galileo in the latter production and instantly evoke images of the great Freddie himself. Now, with the majority of the production set in Uganda there was one more musical that would be overtly referenced and it is fairly clear which one that would be. Right from the off, the Elders are sent on their missionary trip by a black woman dressed as Rafiki singing a non-copyright copy of the opening to the Circle of Life. The strong African percussive drumming in 'Hasa Diga Eebowai', the colourful African costumes (especially those worn when the natives were performing for the Mormons in the second half) and the savannah backdrop all had a touch of the Lion King in them. All this of course was cleverly disguised in witty insult - the song mentioned above is less than complimentary and the costumes displayed are made out of colourful rubbish bags and old potato sacks, all very akin to a backhanded compliment (Ann Roth deserves a mention here in judging the costume design just right). Up until now it seems as though Mormon is pretty much perfect with very little to criticise. Then came one particular scene in the second half that was not successful - the world of the Spooky Mormon Hell Dream. Elder Price (Creel) has a crisis of faith and dreams about his imminent departure to hell, having been rejected from the Mormon church. The song was reminiscent of a poor man's Meatloaf - a poorly constructed gothic rock number with weak lyrics, the whole scene was staged wrongly. Of course it was over the top (the whole musical is) but it felt displaced; the rest of the musical had toed that very careful line of being fantastical without being ridiculous, insulting without being offensive and emotional without being tacky. During this scene I felt a disconnect, almost as if I wasn't watching the same musical anymore; an error in judgement made here in an otherwise top notch, top 5 show. All in all, I can see why the house was full on a Wednesday evening a year after the show opened - a small theatre, exclusive tickets and an incredible cast make this witty, tongue in cheek triumphant musical still one of the hottest spots in town. And I predict it will stay that way for a long time to come. Everybody loves dinner after a show in the West End but it has to be the right show to give you time for a bite and your journey home afterwards. Now, thanks to producer Nica Burns there’s BAKERSFIELD MIST, a perfectly formed slice of drama, starring real life, Hollywood royalty that whizzes through in barely 90 minutes leaving you plenty of time to search out that perfect Covent Garden eatery for supper, a glass of wine and a chat about what you’ve seen.